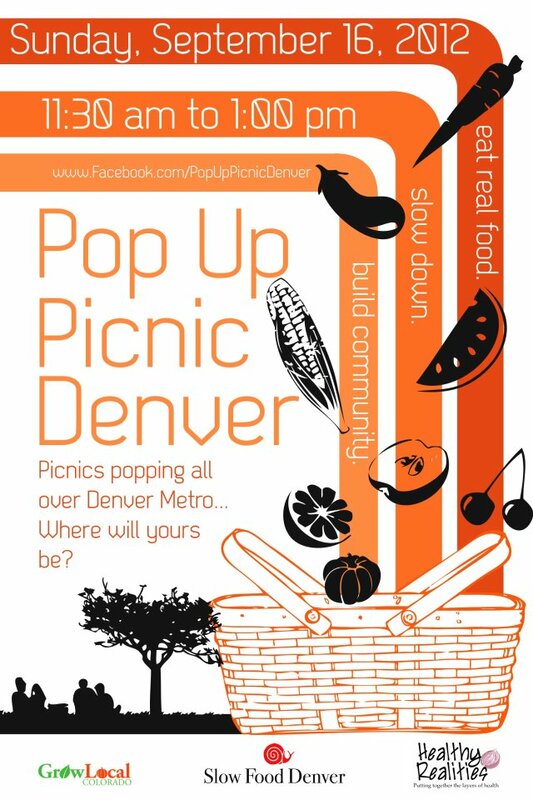 Pop Up Picnic Denver is a one-day event open to participants city-wide starting at 11:30 a.m. on Sunday, Sept.16. Created by Slow Food Denver, Grow Local Colorado, and Healthy Realities, the event intends to bring awareness to the value of slowing down, eating real food and building community. Anyone in the city of Denver may create a picnic site - Pop up Picnics can be as simple or elaborate as the host desires and can range in size from two people to two hundred. Pop Up Picnics can occur anywhere around the city from backyards to park benches. The "where" and "how" is up to the host and attendees of each site. Pop Up Picnics are a blank canvas for the imagination and creativity of the participants, who are encouraged to incorporate a theme, art, music or theater. We suggest creating a menu featuring real and healthy food, using locally sourced ingredients when possible. During the Picnics, each Pop Up site is asked to create a video answering four questions to describe their experience:: "Who is attending your picnic? Where is your picnic taking place? What are you eating? We love Pop Up Picnic because..." Pop up Picnic Denver will compile video submissions to create a short documentary showcasing Denver's support of the Slow Food Movement. "For many people, grabbing a pre-made sandwich and eating it on the run while standing up, driving, or checking email is a daily occurrence, " says Megan Gilroy of Healthy Realities. "When our days are filled to the max, it's easy to forget about how we eat - which is just as important as what we eat." Pop Up Picnic participants may sign up to host a picnic from now through Sept. 15. 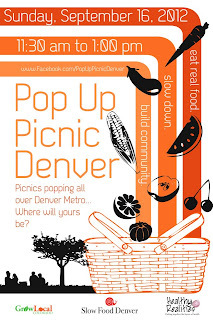 To sign up or learn more about hosting a Pop Up Picnic, visit www.facebook.com/PopUpPicnicDenver.